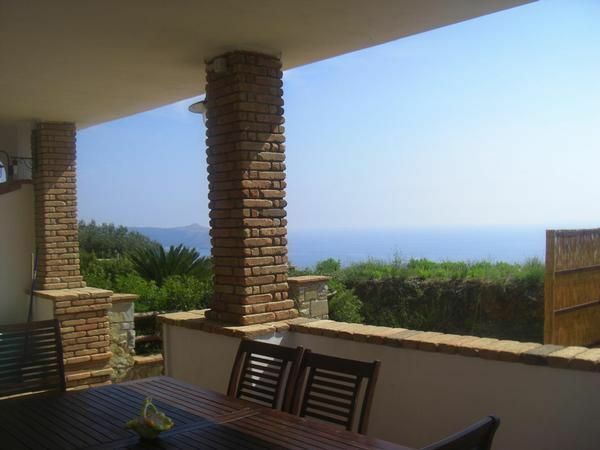 CASA ELISABETTA: a large villa with two apartments, a garden for children with pool and a magnificent sea view, raging from a low hill standing directly onto Palinuro Bay and just two kilometres away from the sandy and white beach of Capo D’Arena. Apartment 1/CASA ELISABETTA: (100 sq.m/max. 9 people), 3 bedrooms 2 bathrooms/shower, large entrance-living room, kitchen, roofed and furnished porch with large sea-view over Palinuro Bay. Our apartments are completely furnished: Sat TV, fridge, micro wave, traditional oven, small kitchen electrical appliances and barbecue grill. - Cot for children: once per object for rent at a price of 10 EUR (optional). - Baby-Kit: once per object Costs amounting to 10 EUR (optional). - Pet: once per object Costs amounting to 20 EUR (optional). - Towels: per person and week for rent at a price of 2.5 EUR (optional). - Bed linen: per person and week for rent at a price of 2.5 EUR (optional). CASA ELISABETTA stands on a low hill reigning over the Gulf of Palinuro just 1000 metres from Caprioli di Pisciotta, a picturesque village with numerous facilities for tourists and only 2000 metres from the sandy beaches of Capo D’Arena and the Spiaggia delle Saline. CASA ELISABETTA is situated in a residential part outside of Caprioli di Pisciotta and just 5-6 kilometres far away from the most famous and elegant resort site in Cilento, Palinuro, which lies a bit further, but which can be reached in just 10 minutes by car. Bed linen (per person and week, according to consumption 2.5 EUR). Cot (once per object, Costs amounting to 10 EUR). Parking facilities (per property and day, included in price 0 EUR). Pet (once per object, Costs amounting to 20 EUR). Towels (per person and week, according to consumption 2.5 EUR).